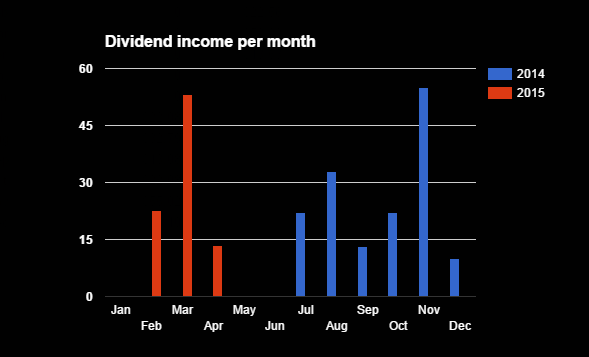 Dividend for Starters: Dividend income & dividend raise! Dividend income & dividend raise! KO paid me $13.53 for the 41 stocks I own. In order to achieve the annual $300 of dividends, I should have received $100 by now. Unfortunately the sum of received dividends is stuck at $75.91. However, 15% tax is already deducted from the $75.91, so the gross amount of dividends is around $89. I'm not sure whether I meant gross or net when I set the $300 goal.. Being behind schedule gives me motivation to research new investment oppertunities, so expect to see more information on that, as soon as possible! My nice friends over at Johnson & Johnson (JNJ) decided to give me a 7.1% raise! I'm wondering why I'm working so hard at the office. They provided me with a 0% raise, last January. On the other hand, in order to obtain this 7.1% raise, I did absolutely nothing. JNJ raised their quarterly dividend from $0.70 to $0.75.